Farley P. Katz is a tax lawyer in San Antonio who collects rare books, manuscripts, and “too many other things.” He is one of the contributors to the medieval fragments project, a crowdsourcing research project headed by archivist Micah Erwin to identify fragments of medieval manuscripts bound into rare books at the Ransom Center. Katz describes a recent discovery below. Recently, I identified a very unusual and interesting manuscript waste fragment on archivist Micah Erwin’s medieval fragments project Flickr site. The fragment was used as a pastedown inside the rear cover of some collected works of Cicero printed by Aldus Manutius in Venice, Italy, in 1514. Its call number at the Ransom Center is Uzielli 99, referring to Giorgio Uzielli. The Ransom Center holds a collection of books printed by Aldus and his successors. The Flickr posting noted only that the fragment includes a calendar possibly from a book of hours (a medieval devotional book containing prayers, hymns, and religious calendars and often painted miniatures). There was text below the calendar that included French words. I could make out “C’est mon” and “Et tout,” but little else was easily readable. The fact that each line began with a capital letter, however, suggested that it might be a poem. Et tout prest de don-ner des eaux. Rudy and Stuip explained that these are not mere amusing rhymes, but actually a complex mnemonic device known as a “Cisiojanus” (from Circumcisio Januarius, referring to the Feast of the Circumcision of Christ, celebrated on January 1). The number of syllables in each poem equals the number of days in the month. So for March, which has 31 days, there are 31 syllables. The most important saints or holy days of each month are identified by name and numerical position in the poem. Thus, the first syllable of the March rhyme starts with the name Aubin and St. Albinus’s day was March 1. Similarly, the twelfth syllable of the rhyme starts with Gregoir, whose feast day was March 12. Cisiojani (the plural form) originated in Germany in the twelfth century in Latin and were later produced in vernacular languages, ultimately making it into early printed books. Manuscripts written in French of Cisiojani, however, are quite rare. It’s difficult to date the manuscript fragment because the text is obscured, but an educated guess would be fifteenth century. Although I have not seen the book “in person,” the catalog states that it has a “Fanfare” binding. Fanfare bindings are ornate bindings in which the covers are divided into many compartments often filled with gold tooling. They originated in France in the sixteenth century and spread throughout Europe. 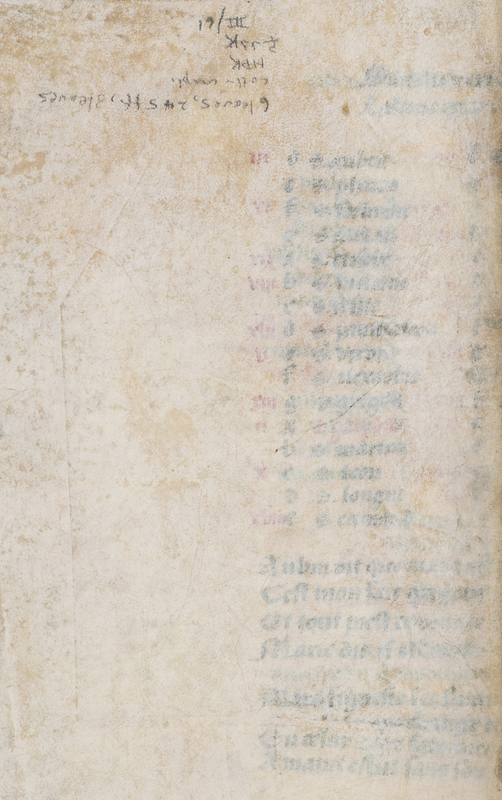 Since Uzielli 99 contains manuscript waste from France, it most likely was bound there. Identifying this manuscript fragment at the Ransom Center thus not only adds to the limited body of knowledge about French Cisiojani but also provides evidence of where an early bookbinding was probably made. Image: Detail of Uzielli 99 manuscript.